Baby DK, the Jungle King! Baby DK, the Jungle King! is the first level of World 2 in Yoshi's Island DS. This level introduces Baby DK. This level begins with an Ukiki kidnapping Baby Peach and Baby DK falling onto Yoshi's back. After Yoshi finishes the level, Baby Peach is freed and Baby DK stays with him for the rest of the game. This level introduces Baby DK's abilities, such as climbing vines and swinging from ropes. Yoshi and Baby DK begin the level near a bunch of vines hanging on the ceiling, with some Ukikis climbing said vines. Some coins, including Red Coins can be collected in these vines, using Baby DK's abilities. After utilizing the vines to cross a tall platform, Yoshi finds a Message Block, telling him about Baby DK's ability of swinging in vines. This ability must be used ahead, as Baby DK must swing in a vine to reach a tall platform. In a small alcove, Yoshi can simply find two Nipper Plants. Some Ukikis can be found ahead of here, either running or hanging in the walls. Yoshi must utilize another swinging vine to progress. Some Piranha Plants can be found in this area, along with some vines that Yoshi needs to use in order to proceed. Yoshi can use the Baby DK's Dash Attack to reach a small area to the west, where he can find some coins, and a locked door. The key to open this door is found been carried by an Item Balloon. 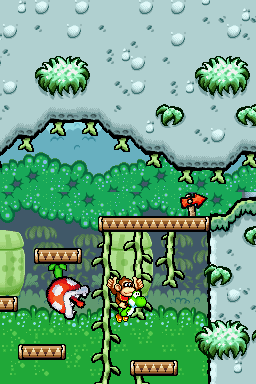 Once Yoshi reaches the top, he finds a Middle Ring, a Message Block telling him how to swing on vines, and a swinging vine that must be used to not only collect red coins, but also reach a tall platform. Another nearby vine hanging on the ceiling can be used to reach some red coins. Yoshi must follow the path, while dealing with Piranha Plants, Ukikis and Nipper Plants, until he reaches an area with several vines. Yoshi can climb these vines to reach a small area in the ceiling with red coins. In this area, there is a flower hidden on top of a bunch of red destructible blocks in the ceiling, easily destroyed by one of Yoshi's explosive eggs. Another flower can be collected the same way, just ahead. The next section involves Yoshi utilizing Baby DK's Dash Attack to destroy rows of Pointeys, which block his path. Yoshi can discover another secret area on the ceiling, but the only way to reach it is by using Baby Peach to catch a wind current. Yoshi can also find a flower nearby, and, to collect it, Yoshi must swing on a vine. The goal roulette is located ahead of this vine. When Yoshi completes this level, he finally encounters the Ukikis responsible for kidnapping Baby Peach, and simply uses his Dash Attack to defeat them, thus rescuing Baby Peach. Mori no ōja DK(dīkē)! Jungle King DK! German Der König des Dschungels "King of the Jungle"